It has been a fairly safe assumption for some time now that Canada's team for the 2010 Paralympics would include Jim Armstrong at skip and Darryl Neighbour at 3rd. Coach Wendy Morgan's confirmation that the team would include two women, left just one slot open for speculation. High Performance Director Gerry Peckham confirmed last night that failing injury or unforeseen circumstance, or a catastrophic loss of form, Ina Forrest and Sonja Gaudet would join Jim and Darryl on the team. "Their performance within the selection process over the past few years and their gold medal achievement at the 2009 World Wheelchair Championships has placed them in excellent stead to be selected to the 2010 Team," he said. "We felt it made sense to let the athletes know their relative status as early as possible, to help each of them plan their year. We have added Jackie Roy, an accomplished curler, as a backup to Ina and Sonja, as we are committed to having two females on the team. Chris Sobkowicz, Bruno Yizek and Gerry Austgarden will compete for the remaining slot. "The carded athletes for the yearly cycle beginning this July are the five members who won the 2009 Worlds, plus Bruno Yizek on a "D" (development) card. Cardings are always a lagging indicator, based on past performance. Bruno was carded as he was 6th on our depth chart, though with everyone so close, that doesn't imply he is favoured to make the team over Gerry and Chris." The squad will play in Norway and Scotland between October 12 and 23, and Peckham says selection of the 2010 Paralympic team will occur that month. Canada's Paralympics squad includes a third female, Jackie Roy, who takes the place of fellow British Columbian Gary Cormack. Coach Wendy Morgan said that the decision had been made to include two females in the final team. This reflects program director Gerry Peckham's concern that having only one female posed an unnecessary risk of default were she unable to play. Given this concern, a third female makes sense, both to provide backup and some competition for places until the team is announced late this year. Jackie Roy has high performance competition experience as a summer sport Paralympian, and has twice won gold at the Canadian Nationals, playing lead for Jim Armstrong. Team Canada coach Joe Rea said in February that there was little to choose between Roy and other members of the national squad. Curlers outside of BC, especially Albertans, may be disappointed that the squad was not widened geographically, especially after Bridget Wilson's All-Star performance as lead for Team Alberta. Team Canada are looking for someone who can throw reliable up-weight stones at lead. While Ina Forrest has that ability, the coaches prefer her at second. Sonja Gaudet is reworking her delivery to add weight, and I am not sure that Jackie Roy offers a challenge in that regard. But then neither does Alberta's Wilson. My feeling is that given that whoever was chosen to be third woman is unlikely, absent injury, to make the final cut, the decision to pick Roy was a pragmatic one. She is a more than competent lead, has "big game" experience, plays regularly with Armstrong and Neighbour, and lives close to where most of the training is likely to take place. Gary Cormack, a Torino gold medallist, loses his squad place, though Gerry Austgarden and Bruno Yizek have "based on the last 3 years of evaluation" been invited to "try out" for the team. I have in the past quoted Peckham as saying that each of the eight squad members will have an equal opportunity to compete for a Paralympics team spot once training begins in July. Whether that assurance has survived the post-season evaluations remains to be seen. 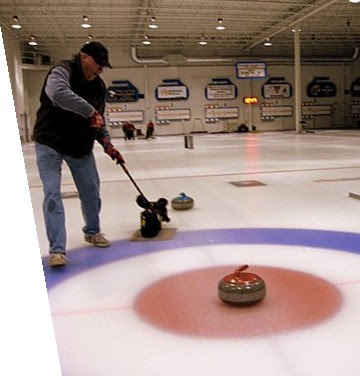 The current carding cycle, the mechanism by which five curlers receive a full and one a development monthly stipend to support their training, ends in June. It will be interesting, and probably indicative of future prospects, to know who has been chosen to receive funding through 2010. A late decision last season by the Ontario Curling Association to restrict participation in their provincial championship to just four teams, one from each region, denied Ontario wheelchair curlers the same opportunity for provincial honours offered other competitors. One of two Ottawa teams was eliminated in a playdown, an exclusion that was felt by supporters of wheelchair curling to be arbitrary, discriminatory and unnecessary as well as detrimental to the long term health of the sport in Ontario. When the championship was held, there was a significant last minute change to the rules for competition that changed the expected semi-final format from three teams to four. Various proposals for change in 2010 have been discussed at the Zone level and OCA Executive-Director Doug Bakes has promised that the Rules Committee will visit issues raised at their next meeting. 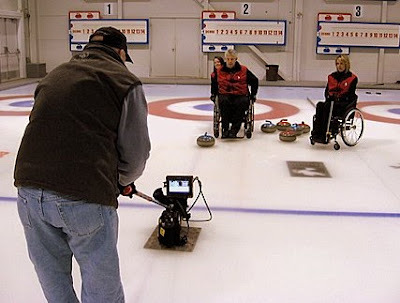 Ernie Comerford, who is working to establish a London based wheelchair curling group, has circulated an analysis of last year's problems, with constructive suggestions for change that encourage inclusion and participation, rather than arbitrary exclusion. You can read his presentation HERE (Word doc). If you have any comments or suggestions, his contact information is included in the document. My (admittedly long-distance) impression is that the OCA, six or seven years into supporting wheelchair curling in Ontario, are disappointed that the number of participants has failed to grow significantly over that period. 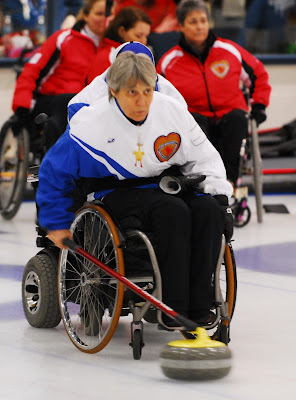 While that is no reason to exclude a second Ottawa team by halving, for wheelchair curlers, the usual number of teams allowed in a provincial championship, frustration with a lack of progress in participation levels may have played a part in a reluctance to take wheelchair curling as seriously as other aspects of the sport. I would be happy to stand, or rather sit, corrected. The CCA had hoped to have an announcement of the venue for the 2010 Canadian National Championships before the end of the very successful Halifax 2009 event. Come the final banquet, a deal had not been signed and the teams left with the traditional assurance that the 2010 championship would be held "somewhere in Canada." The venue will be Kelowna, BC from March 16 through 21. Kelowna CC is a 12 sheet club, recently refurbished with wheelchair access in mind. There is a large elevator to the upper lounge that will allow good spectator access. The question remains though, with the Paralympics taking place in Vancouver at the same time and probably four and possibly all five of the national team plus the coach coming from BC, will anyone be paying attention? The delay in announcing the venue would seem to indicate that it has been a struggle finding a club with the facilities to handle 50 plus wheelchair users and to take on the responsibility for moving them between hotels and club. 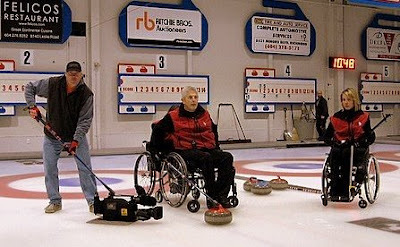 Kelowna CC has always been supportive of wheelchair curling, and was the venue for the world's first wheelchair Cashspiel featuring the Great Britain Paralympic squad, back in March 2005. CTV/TSN were at the Richmond BC rink to film Team Canada at practice. 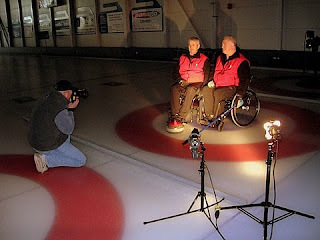 The film will be used as part of their promotion of wheelchair curling during their coverage of the Paralympics next March. Photographer Dan Bailey improvised a small sled for his camera to ge low angle close-ups of the culring stones being thrown.